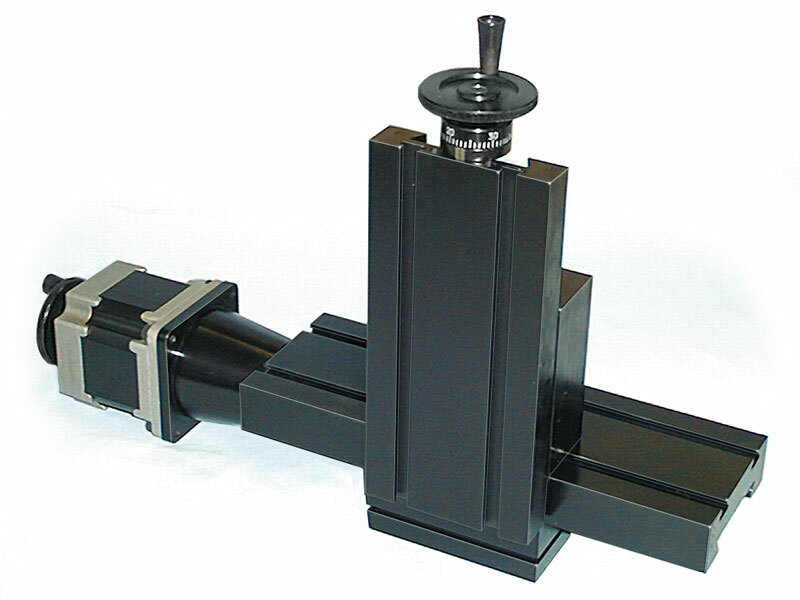 An accessory, the P/N 1185 8" manual vertical milling table, is shown attached to the table of the P/N 6552 single-axis CNC machine slide. Sherline Products, Inc. manufactures a complete line of miniature lathes and mills. Over the past 30 years, a very large line of accessories has been developed to fit these tools. Many of them can be used directly on the industrial slides and components that share the same tables and T-slots. Included in the list below are links to the instructions for each accessory when available. The large line of accessories available for Sherline Industrial slides and spindles significantly enhances their utility. 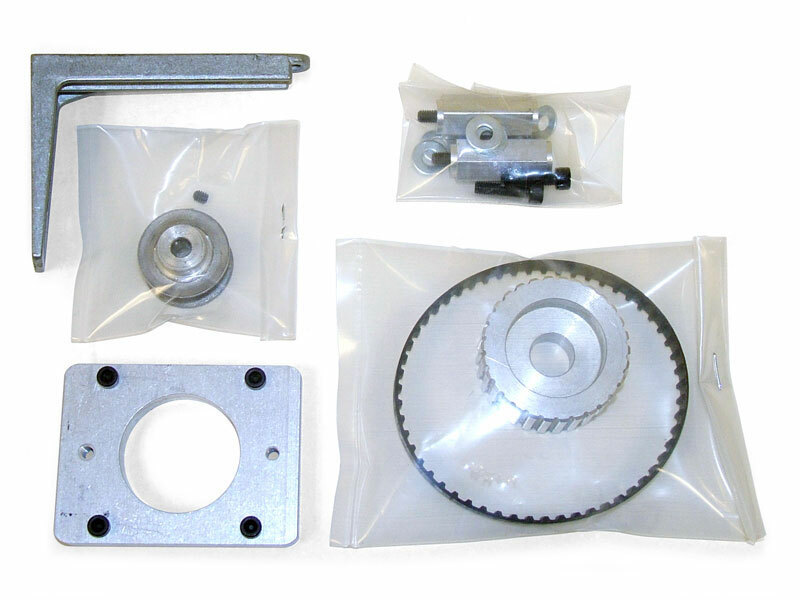 Shown below are just a few examples of accessories manufactured by Sherline to fit their machine tool line. These items can be used with the industrial line as well, should your application require it. Sherline's rotary table (P/N 3700) is one of the many accessories that could be used on any Sherline Industrial slide or table. Its 2-inch height and 4-inch diameter make it appropriate for providing an accurate rotary function in a small area. 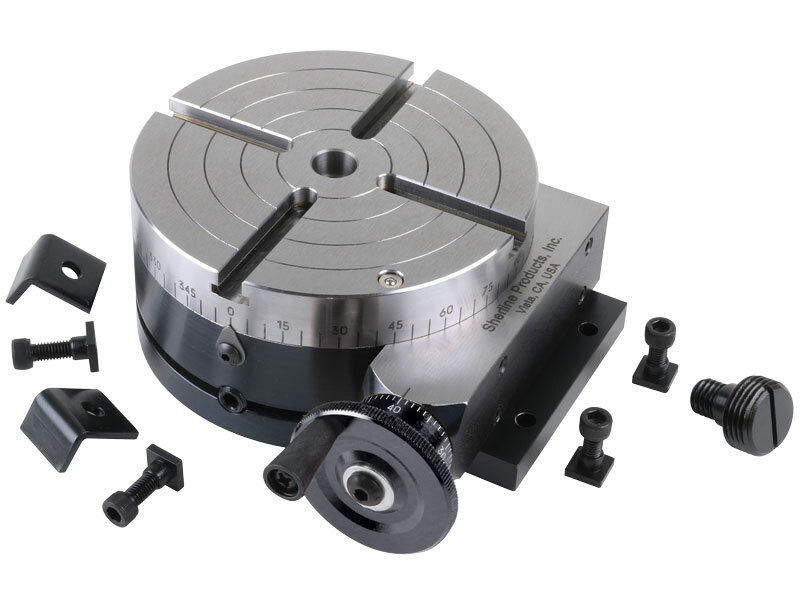 A CNC-ready version is also available, as is a complete, stand-alone CNC rotary indexer based on the same table (P/N 8700). Sherline manufactures 3-jaw and 4-jaw chucks that will thread directly onto the 3/4-16 thread of the Sherline industrial spindles. They can also be clamped to the tables as work-holding fixtures. Drill chucks can be held in the #1 Morse internal taper of the spindle. Sherline now also offers 3.1" chucks that thread onto the ER-16 spindle that is optional on all Sherline IPD headstocks. 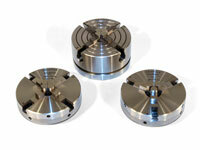 Available are 3- and 4-jaw self-centering chucks and a 4-jaw independent chuck. Sherline offers a line of 3-jaw, 4-jaw and drill chucks. The 3- and 4-jaw chucks are manufactured in Sherline's own plant and have a 3/4-16 spindle thread to fit most of the Sherline Industrial headstocks. 22 x 1.5 mm threads are also available on some chucks so they can be used with the optional ER-16 spindles. The drill chucks are equipped with a #1 Morse tapered arbor that can also be held in the headstock and secured with a drawbolt. 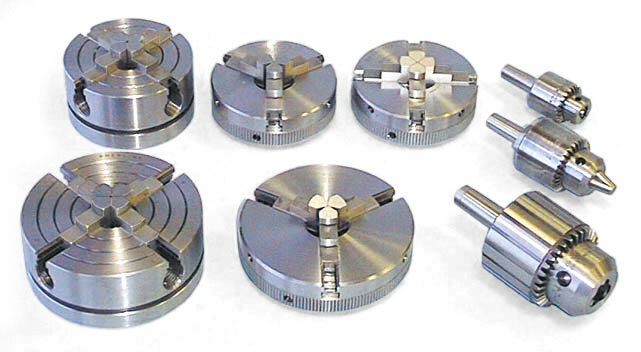 The 3- and 4-jaw chucks are available in either 2.5" or 3.1" diameters. The 3-jaw chucks are self-centering. 4-jaw chucks are available with either self-centering jaws or independently adjusted jaws. The chuck jaws are reversible to hold larger parts. The drill chucks are available in 5/32", 1/4" and 3/8" sizes. #0 Morse arbors are also available for the drill chucks for use in the tailstock of a Sherline lathe. WW COLLETS-Sherline manufactures its own line of WW collets. The collet adapter fits in the #1 Morse headstock taper. Collets are drawn into the collet adapter with a drawbar inserted from the back of the spindle. WW collets are open all the way through to allow long material up to the size of the collet to be held through the spindle. Collets go from 1/16" to 5/16" by 64ths or from 1.5mm to 8mm by .5mm increments. 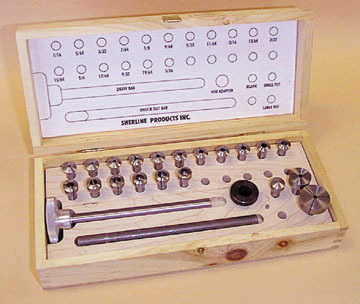 Shown above is a deluxe inch collet set with a selection of 17 collets (14 in metric set), drawbar, knockout bar, blank collet and collet pot chucks in a custom wooden box. Collets are also available individually. MILL COLLETS-Mill collets are also available in sizes from 3/32" to 1/4" or 3.0mm, 4.0mm and 6.0mm. Unlike a WW collet, mill collets do not have a hole through the center. They are made to hold single-ended milling cutters very accurately on center. END MILL HOLDERS-These accurately machined holders thread onto the 3/4-16 spindle thread and will hold double-ended end mills. The 3/4-16 internal threads are single-pointed during a multiple-step CNC machining operation to assure concentricity. The most common size is 3/8", but other size end mill holders are also available to hold 3/16", 1/4", 5/16", 6.0mm, 8.0mm and 10mm end mills. A set screw tightens on the flat of the end mill to secure it in place. Keeping several end mill holders on hand with cutters already mounted is like having a quick-change tool system, as the holders can be quickly threaded onto or removed from the spindle. A large selection of tools, collets and work-holding devices have been designed to compliment the miniature machine tool line. For a complete list of accessories, see Sherline's "Accessories" page at Sherline Accessory Instructions. In it is a list of links to the instructions for each accessory. You can read about each item in detail and find out how it is used. Some of the work-holding fixtures that might be of use to you are listed below, but the list is by no means complete yet.